Rubber Soul is a great album, but it might actually be a little under-appreciated. These days, Sgt. Pepper and Revolver get most of the praise, and a lot of fans think Rubber Soul should be right there with them. One reason it might not be, is because of the differences between the British and American versions. They’re somewhat like two separate albums…with a six song variance. The American version starts off with a song that had been on Help in England…”I’ve Just Seen A Face”…a country-tinged acoustic song. The first track on side two was also from Help, “It’s Only Love”, another acoustic song. Capitol Records apparently wanted Rubber Soul (released December 3rd, 1965) to fit in with the Folk Rock trend of that year. Besides adding the two acoustic songs, they took away 4 songs…”Drive My Car”, “Nowhere Man” (released as a single in February, 1966), “What Goes On”, and “If I Needed Someone”. The British version of Rubber Soul started with a rocker, “Drive My Car”. Paul McCartney said “Drive My Car” and some of the other songs were influenced by American soul music. The name Rubber Soul came about after McCartney heard an American musician use the term “plastic soul” when referring to Mick Jagger of the Rolling Stones. McCartney said he thought of Rubber Soul as an English version of soul music. Meanwhile, American fans mostly thought of Rubber Soul as a Folk Rock album, because of the song choices. Here are the album track lists. The U.S. version has 12 songs, and the U.K. version 14. The original vinyl albums divided the songs equally between the two sides. Here’s a confession. Although my Beatles playlists basically follow the British album versions, I placed “I’ve Just Seen A Face” at the beginning (and moved “Drive My Car” to the middle), because to me it’s not Rubber Soul without it! Capitol Records succeeded in having Rubber Soul be mostly an acoustic album to fit the trend, but in doing so, they left off three really strong songs…”Nowhere Man”, “Drive My Car”, and “If I Needed Someone”, which hurts the overall impression of the quality of the album with Americans (even though it was extremely popular as it was). Surprisingly, the American version of Rubber Soul included no singles at all. That did have the positive effect of the album being thought of as an artistic statement, rather than just a collection of songs. Let’s look at how the full version of Rubber Soul came to be. Already in 1965, The Beatles had been touring, wrote and recorded the songs for the album Help, filmed the movie of the same name, and then toured America (including the Shea Stadium concert). So of course their record company wanted them to do another album before Christmas. Holy night! How much can one band do! It was already mid October, 1965. The Beatles needed to write, record, and mix 16 new songs (14 for the album, and 2 for a single) in about a month and a half! As crazy as that sounds now, it was actually more uninterrupted time than their hectic schedule had allowed for previous albums. While on tour, The Beatles had interacted with Bob Dylan, The Byrds, and other American artists. Dylan introduced them to marijuana and his lyrics. Both would expand The Beatles thinking and affect Rubber Soul. The Beatles’ songwriters came through. John Lennon was the most prolific. He was the lead writer on 9 songs…including “Norwegian Wood”, “In My Life”, “Day Tripper”, “Girl”, and “Nowhere Man”…which John said just came to him all at once. Paul McCartney was the main writer on 5 songs…“Drive My Car”, “You Won’t See Me”, “We Can Work It Out”, “I’m Looking Through You”, and “Michelle”…one of the most recorded songs of all time. George Harrison provided 2 songs…”Think For Yourself” and “If I Needed Someone”…which was a salute to the style of their new friends, The Byrds. “We Can Work It Out” and “Day Tripper” were selected as a double A-sided single to be released the same day as the album, but were not actually on the album. Rubber Soul accented intricate three-part vocal harmonies to go with the more sophisticated lyrics. Even though The Beatles were on a deadline, they were innovative. This was the first rock/pop album to use a sitar. They also incorporated other unusual instruments, including a harmonium (a type of pump organ). George Martin was able to produce a Baroque harpsichord sound by playing a piano part along with a slowed down tape of “In My Life”, and then having the effect sound perfect at regular speed. Rubber Soul was the transitional step The Beatles needed to get to the full studio experimentation of Revolver and Sgt. Pepper. We all know there is no definitive answer as to what Beatles album is best. Our own opinions can change. But, how does Rubber Soul stack up? When The Beatles put together their 4-record “best of” collection known as the red and blue albums, they selected more songs from Rubber Soul than any other album…8 of the 16 songs recorded during those sessions. In a 1995 interview, George Harrison said it was his favorite Beatles album. This past week there was a significant milestone in how we consume music. The total combined sales of vinyl records and Compact Discs has now passed digital purchases on iTunes. That’s a major change, because digital downloads had been dominating physical sales in recent years. CD sales are still greater than Vinyl, but are on a downward trend, while record album sales continue to rise. Together…Vinyl, CD’s and digital downloads make up a little less than 25% of music sales. Of course there are plenty of people listening to the music they’ve already purchased in those forms. Digital sales are being replaced by streaming, with services like Apple Music, Spotify, Pandora, and YouTube. Streaming now accounts for 75% of all music revenue. It grew 30% last year. Subscribing to streaming services appears to be the present and future of music listening, but let’s look at the past and how we got to this point. Recorded music for the public started in the late 18-hundreds with Edison-style phonographs using playable cylinders. Above is a single-play coin-operated Columbia Gramophone owned by friend and collector David O’Hanlon. Next came the 10-inch 78 revolutions-per-minute (rpm) discs played on phonographs. Each record held only one song per side due to time constraints of the large groove. The above Vogue picture record from 1946 is one of the first 78 rpm records available to the public that was actually made from vinyl. Vinyl was a great improvement in sound over the old shellac 78’s. It was two years later, 1948, when vinyl 33 & 1/3 rpm music albums were introduced by Columbia Records. Similar technology had been tried for years, but it was Columbia that made it successful. The trick was to make smaller grooves and a more sophisticated needle & cartridge. This allowed 22-and-a-half minutes per side, so longer classical pieces or multiple popular songs could be put on one disc. They called it a Long Playing Microgroove, and it became LP for short. A year later, 1949, RCA Victor introduced 45 rpm singles. Stereo followed in the ’50’s, and became popular in the ’60’s. Stereo components like those shown above were standard in the ’70’s & ’80’s, when album sales peaked. Cassettes were very popular for awhile (for their portability), but both records and cassettes lost the battle to digital Compact Discs by the late 1980’s. One of the first all-digital recordings and most popular CD’s was this 1985 album by Dire Straits…Brothers In Arms. It was also released on vinyl, but the time limitations forced the band to edit some of the songs into shorter versions. CD’s can hold 80 minutes of music, compared with about 45 minutes on record albums. Compact Discs dominated over the next two decades, but then on April 28th, 2003 Apple opened its iTunes store. You could now buy songs for 99-cents each, and also load-in your own CD’s. The songs would be on your computer, or a little portable player called an iPod. Although a Classic iPod is about the size of one cassette, it can hold over 20,000 songs at the highest digital quality. For nearly 15 years there were huge digital sales of albums and singles. Now, digital sales have plunged, and as mentioned at the beginning of the article, the total combined physical sales of CD’s and Vinyl records surpasses download sales. Our old friend the vinyl album started it’s resurgence in about 2009. It makes me think I shouldn’t have sold my thousands of vinyl albums and CD’s (most anyway). But, then I remember how much space they took up, and how hard it was to move all of them. It’s cool to have some vinyl albums to enjoy, and a decent stereo isn’t real expensive. However, each new album of about 12 songs costs $25. To duplicate the nearly 20,000 digital songs I own with a vinyl collection (and not garage-sale worn-out records) would cost more than $40,000! The reality is it would be impossible to duplicate a serious digital collection on vinyl, because not all songs are available in that form. Digital downloads brought back a lot of songs and albums that are otherwise discontinued. It makes a lot more sense to pay the $10 a month for streaming and instantly choose from over 50-million tracks. Like my friend Jodi Gehr told me…she found a new female artist she likes, and already “owns” everything she’s recorded. Too bad streaming wasn’t available in the 1960’s! Vinyl, CD’s, streaming…enjoy music in whatever way makes you happy. Life is better with music. Those lines were sung early in a concert this weekend in Salem, Oregon as Kris Kristofferson sang “Me and Bobby McGee”. What a great experience to see and hear the man who wrote so many classic songs perform them live. Kris Kristofferson is now 82 years old. His gravelly voice always added character to his recordings. He still has that same basic tone to his voice, but it’s lost some of it’s highs and lows. Despite those vocal limitations, it was very special to hear this poetic composer treat us to so many great songs. ”Help Me Make It Through The Night” was considered a scandalous affair when Sammi Smith sang it in the early ‘70’s, but is certainly mild by today’s standards as Kristofferson sang it Saturday night. Supporting Kristofferson was the band The Strangers, which was the backup group for Merle Haggard. The band was absolutely first rate. They were also very good singers who took over some of the lead vocals as Merle Haggard hits were sprinkled in. Most of those songs were uptempo, and added a nice change of pace, because many of Kristofferson’s songs are ballads or mid-tempo. “Well I woke up Sunday morning with no way to hold my head that didn’t hurt.” As Kristofferson sang “Sunday Morning Coming Down”, he reached the line about finding his “cleanest dirty shirt” and cracked “this one” as he touched the shirt he had on. “Sunday Morning Coming Down” was a real highlight of the concert, not only because it’s a great song, but because it mostly fell in the still strong midrange of his voice. A lot of songs were played during the two-hour concert, including…”Loving Her Was Easier”, “Just The Other Side Of Nowhere”, “The Pilgrim, Chapter 33”, “Nobody Wins”, “For The Good Times”, and “Why Me”. Because my wife, Jeannette, is such a Kris Kristofferson fan, we bought tickets right away and were in the sixth row. All of the photos were taken from our seats to the left side of the stage in the beautiful Elsinore Theatre in Salem. Kristofferson still draws crowds. He had a show in Spokane on Thursday, in Seattle on Friday, and because his Saturday show sold out in Salem, another show was added for Sunday in Portland. Kris Kristofferson wrote lyrics for country songs that were like no others. We were fortunate to see the legend himself singing the lyrics to songs we love. In 1998 I started collecting old radios from the 1930’s and 1940’s. It was about that same time when my aunt, Margaret Hall, gave me the below picture disc from her record collection. It was a nice visual to show the kind of music that would have been played on the radios of the 1940’s. It’s a 78 RPM Vogue Picture Record with the colorful artwork right under the grooves. The 10-inch record was put together with an aluminum core, paper artwork, and clear vinyl holding it all together. When picture records came out in May of 1946, they were popular for the novelty, and for the improved sound of the vinyl compared with the older shellac records. However, Vogue records were only manufactured until April of 1947, because the company, Sav-Way Industries in Detroit, had financial problems. In total, there were about 74 different records released during that one year. I collected a few Vogue records over the years. The 1940’s artwork was done by multiple artists, so the styles varied. I really like the dance orchestra theme of the record my aunt gave me, and the cool jazz look of the instruments on the above record. By the way, “Musicomania” preceded Beatlemania by almost two decades. Although the songs were usually well known, like George Gershwin’s “Rhapsody In Blue”, the artists were not necessarily well known, nor well named, like…The Hour Of Charm All Girl Orchestra. “Have I Told You Lately That I Love You” was a big hit for Scotty Wiseman (who wrote it) and his wife Lulu Belle. It was also a hit for Gene Autry. The 1946 Vogue picture record has the look of post-war America. Van Morrison must have liked the title, because he used the same line for his song, “Have I Told You Lately”, that was made popular by Rod Stewart. They’re both good songs. “Stardust” is one of the most-recorded songs of all time. You can see that instead of being recorded by a Big Band, it was done by a Large Chorus. And this one was by a small band…The Charlie Shavers Quintet…although from the artwork you might think it’s a trio. One of the nice things about Vogue records is that you get completely different artwork on the flip sides. Below are the same six records shown above, but with the artwork from the other sides. You can click on the images to enlarge. Vogue picture records are collectable, but generally not extremely rare, because who would throw them away? Values vary greatly, ranging from about $25 to over $100 for titles that are available; however, a couple of extra-rare ones could cost into the thousands. The picture record process was also used for some children’s recordings and sporadically for novelty collectibles, but picture discs (as they are now called) have never been consistently produced. The famous album cover was on one side, and the drum head on the other, although the record was produced later with the cover photo on both sides. In 2017, Apple Records recreated the picture disc for the Sgt. Pepper remix. Linda Ronstadt’s Living In The USA album was also available as a picture disc in 1978. There was a wide variety of artists and music styles that got the picture disc treatment in the late 70’s and early 80’s, then sporadically in the following decades. They were usually limited novelty items rather than primary releases, plus Compact Discs mostly replaced records in the late ‘80’s. Our picture discs are currently being displayed on this bookcase. I’ve sold most of my old radios, but you can still see a couple dozen of them in the photo (click to enlarge). You can view the full radio collection at my other site. Just Google…Radios Past. With vinyl albums making a comeback, maybe picture discs will make a comeback too. Bonus Disc: Almost forgot…I have this 45-RPM single. This is a 20th Anniversary 7-inch picture Disc of “I Feel Fine”, which came out in England in 1984. More of The Beatles’ singles got this same treatment at that time. What if no one in the world had ever heard of The Beatles or any of their songs…except for you. That’s the premise of the new movie Yesterday. Yesterday is a romantic comedy. It appears to be in good hands, including British screenwriter Richard Curtis who is known for Four Weddings and a Funeral, Notting Hill, Love Actually, and About Time. Plus, it’s directed by Academy Award winner Danny Boyle. The stars of the film are Himesh Patel (from the British TV series EastEnders), Lilly James (from Cinderella, many other movies & Downton Abbey), Kate McKennon (from Saturday Night Live), and Ed Sheeran (from many hit songs). It’s interesting what Beatles songs they put in the trailer. Featured are “Yesterday”, “Let It Be”, “Hey Jude”, “Something”, and “I Want To Hold Your Hand”. That’s a good start on the best known song catalog in history. Imagine how much the music rights cost! Since this is a romantic comedy, we don’t want to take the premise too seriously, but it does make you think about why The Beatles remain so popular. It’s the quality of their songs. The Beatles’ haircuts, British accents, and Rock & Roll energy may have helped create Beatlemania, but it was their amazing songwriting that kept them popular, and keeps them musically relevant. Yesterday is set to open June 28th. The trailer certainly makes it look like fun. We don’t know whether the main character, Jack, is in a coma dreaming, is in an alternate universe, or whatever else it might be, but the movie should provide some needed escapism from the real world. Linda Ronstadt has released her first concert album, Live In Hollywood. The concert took place nearly 40 years ago, and the master recording had been lost for decades. It’s amazing the master tape was even found. Music producer and friend John Boylan had been checking the internet for any unauthorized use of Linda Ronstadt recordings. He came across an old poor quality video of a Linda Ronstadt concert that aired on HBO in 1980. Boylan was interested in finding the master audio recording for possible release, but didn’t have any luck. Boylan says he was attending his son’s hockey game and told another father, Craig Anderson, the story of the lost recordings. Anderson is an audio engineer at Warner Brothers, and just a day later he called Boylan and told him he found the master tape. It had been misfiled. Boylan says the odds of finding the recordings through a chance meeting at a hockey game must be astronomical. We saw Linda Ronstadt in Omaha during that 1980 tour, and this concert from L.A. captures that time brilliantly. The whole album is good, with her clear and powerful voice sounding the way we remember it. The album has a nice flow of rocking moments and softer moments, and Ronstadt uses the appropriate touches of varying dynamics in each song. It shows her great vocal ability wasn’t limited to the recording studio. For the most part, the songs are performed like her original hits, but are refreshingly “stripped down” compared with the multi-layered studio versions. Also, for “Blue Bayou” she sings the final verse and chorus in Spanish as a salute to her family’s roots in Tucson, Arizona….and “You’re No Good” is expanded with an extra guitar break that lets the band do some jamming. What a band it is! The lead guitarist is Danny Kortchmar, who also performed with James Taylor and Jackson Browne. The other guitarist is Kenny Edwards, who worked with Ronstadt since they had the hit “Different Drum” with The Stone Poneys. Bill Payne, of the band Little Feat, is on Keyboards (his band’s song “Willin'” is covered here). Rounding out the band are some of L.A.’s finest musicians…Dan Dugmore on pedal steel guitar, Bob Glaub on bass, and Russ Kunkel on drums. Backing vocals are by Wendy Waldman and Ronstadt’s manager and main record producer, Peter Asher (of Peter & Gordon fame). Asher also adds percussion. Linda Ronstadt’s popularity was amazing. She did what no other woman, man or band had ever done…she was the first artist to ship an album Double-Platinum. The album was Living In The U.S.A., released about a year-and-a-half before this concert. it was her 6th Platinum album in a row. Her 7th was Mad Love, which was released in conjunction with this 1980 tour. The Live In Hollywood album features three hits off Mad Love, “I Can’t Let Go”, “Hurt So Bad”, and the intensely rocking “How Do I Make You”. Linda Ronstadt was 33 when she recorded her live album. Now she’s 72, has Parkinson’s Disease, and can no longer sing. In a touching interview on CBS, Ronstadt recently said…”I can sing in my brain”…but she greatly misses the physical feeling of actually singing. It’s important that recordings like Live In Hollywood exist to remind the world Linda Ronstadt once possessed one of the greatest Rock and Pop voices of all time. Today, February 3rd, 2019 is the 60th anniversary of the 1959 plane crash that killed Buddy Holly (22), Richie Valens (17), and J.P. “The Big Bopper” Richardson (28) . Because of the song “American Pie”, that tragic event is often referred to as “The day the music died”. I don’t remember the news story from when it first broke. I was 10 years old, and the news wasn’t everywhere like it is today. The fact is, except for knowing “That’ll Be The Day” and “Peggy Sue”, I wasn’t very aware of how special Buddy Holly was until many years later. That’s probably the way it was for most people. Buddy Holly had his first hit “That’ll Be The Day” (#1) in 1957, followed that same year by “Peggy Sue” (#3) and “Oh Boy” #(10). In 1958, he had 4 more Top-40 hits, with “Maybe Baby” being the only major hit at #17. Richie Valens had the two-sided hit “La Bamba”/”Donna” (#2), and The Big Bopper (who was a radio DJ) had one major hit “Chantilly Lace” (#6). He also wrote “Running Bear” for Johnny Preston, and it later became a #1 hit. The importance of Buddy Holly revealed itself over the decades. Musicians who were influenced by him recorded his songs. The Beatles released “Words Of Love” on the Beatles For Sale album in 1964 (on Beatles VI in the U.S.), and had been performing the song live since 1958. They also recorded “Crying, Waiting, Hoping” for the BBC in 1963. The Beatles name was even based on The Crickets. John Lennon thought it was cool that “Cricket” had two meanings…the insect and the game. He wasn’t aware that the game, Cricket, wasn’t well know in the U.S. Of course hearing “Beatles” can bring to mind both the band and the bugs. Paul McCartney is a major Buddy Holly fan, and he wisely bought the rights to all of Buddy Holly’s songs. The biggest popularizer of Buddy Holly songs was Linda Ronstadt. She got major airplay in the mid-seventies with three of his songs “That’ll Be The Day” (#11), “It’s So Easy” (#5), and a popular album track “It Doesn’t Matter Anymore” (written for Holly by Paul Anka). Holly’s “True Love Ways” was a #14 hit for Peter & Gordon in 1965. The Bobby Fuller Four had a hit with “Love’s Made A Fool Of You” (#26) in 1966. “Not Fade Away” has been played and recorded by numerous artists through the years, including The Rolling Stones and The Grateful Dead. “Rave On” is another popular choice of Rock Bands. “Everyday” has been recorded by many artists, including James Taylor. His recording was #3 on the Adult Contemporary chart in 1985. Eric Clapton saw Buddy Holly in London in 1958, and he says seeing Holly on stage with a Fender Stratocaster guitar made him want to have a career in music. Bob Dylan also saw Buddy Holly perform, and he says they looked each other directly in the eyes. Dylan claims it affected his music. Bruce Springsteen says he plays Buddy Holly songs every time before he goes on stage. He said, “It keeps me honest”. Buddy Holly’s influence shows up in other ways. He added a rhythm guitar to The Crickets line-up, and two guitars, bass & drums became the blueprint for Rock bands. He was also one of the first musicians to write, sing, arrange, and produce his own recordings. He experimented with recording techniques, including double-recording his vocals so he sang harmony with himself. He sounded a lot like The Everly Brothers. Shortly before his tragic death, he was working with orchestral arrangements to broaden his sound. All of this from a young man who was just 22, and whose successful recording career was only about 2-years long! In just those two years, his impact was so great that he was inducted into the Rock & Roll Hall Of Fame as one of the first 10 artists. February 3rd, 1959 wasn’t “The day the music died”. Buddy Holly’s music continues to live on through all the artists he inspired, and the new artists they inspire. The estate of Tom Petty has released a major “Greatest Hits” collection. The Best Of Everything is a 2-disc career-spanning set that came out March 1st, 2019. It’s nicely priced on the low end of such collections. You can see the set includes all his major hits and some of his most popular album cuts. Out of the 38 songs, 21 are not on his previous Greatest Hits album. Tom Petty & The Heartbreakers sustained their career for 40 years, and Tom Petty’s songwriting was great all the way through. You’ll notice the order of the songs is not chronological. Probably the main reason is that the presence of Rock music on Radio declined over the years. Tom Petty’s later songs got far less exposure than they deserved. By mixing his songs from the last half of his career with his better known earlier songs, listeners are more likely to get to know the songs they may have missed. As a collector of Tom Petty & The Heartbreakers’ music since their first hit, there would only be a few changes I would make to the list (adding “It’s Good To Be King” and “Crystal River” in place of a couple other songs, and using the more stripped-down version of “Walls” came to mind), but that’s just personal choice, and minor at that. The reality is that this will likely be the definitive collection, and Tom Petty’s family has done a good job…with help from Heartbreakers Mike Campbell and Benmont Tench. 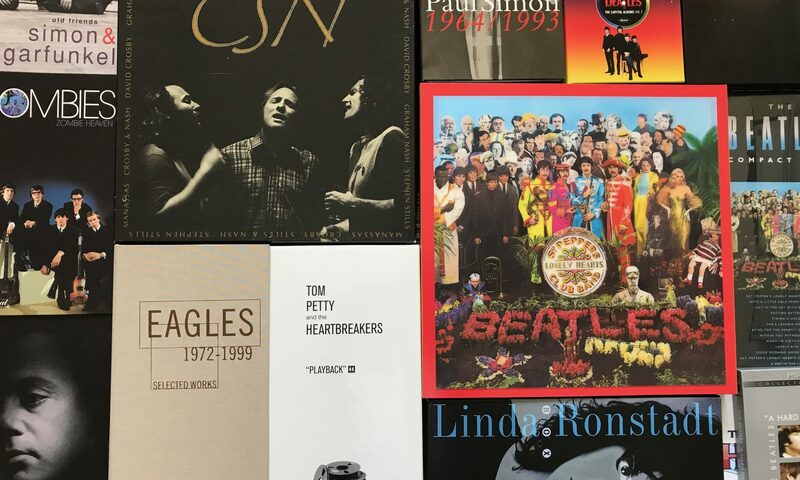 Collectors of their albums know there are a lot more great songs by Tom Petty & The Heartbreakers, but this kind of “Greatest Hits” treatment is always a good idea to get the music to even more people. It’s also a helpful guide for future fans in the decades to come. I don’t take the cynical view that releases like these are “money grabs”. Rather, I think they help keep alive the interest in musicians like Tom Petty…which is a good thing. We can still enjoy all that he did for us…including the music on this new The Best Of Everything collection. Bonus Analysis: Just for comparison, here’s what the same collection of songs would look like if they were placed in chronological order like many “Greatest Hits” albums. The four songs on this Disc 1 not on his previous Greatest Hits album are…”Stop Dragging My Heart Around”, “Southern Accents”, “The Best Of Everything” & “Jammin’ Me”. Only the first two songs on this Disc 2 were on his previous Greatest Hits album. By the way, the one track that was on the Greatest Hits album, but missing here is “Something In The Air” (originally by Thunderclap Newman). If you’ve collected Tom Petty’s studio albums and know the songs, you might prefer this order. Tom Petty was particularly fond of the Wildflowers/She’s The One sessions, and had talked about doing a project based on that music. So, those songs could be developed into a future release in some form.